I have been a total couch potato since Christmas. Well, perhaps not completely, but an overall couch potato. I had great plans for this week, but I'm simply uninspired. I have stayed in bed late reading, I have made lovely breakfasts and savoured my cup of tea, I have worked my jigsaw puzzle, read two novels, seen a movie with my friend Marilyn and generally relaxed. I have, however, finished organizing the clearing out my friend Judy's garage and taken the stuff over to our church rummage sale, made two pies for a dinner at my neighbor's, and cleaned my refrigerator. I have not written my Christmas letter, written thank you notes for Christmas, or done anything else for the good of the world -- both the larger one and the smaller one that surrounds me. Why do I always worry about feeling guilty when I retreat from everything? When Donel was alive, I could share my worries about things I worry about -- and he would put the world in perspective. Since I rarely retreat from everything, I carry this load of guilt when I do. I think I have to apologize for doing nothing. Donel's point of view was that I have a roaming anxiety and when I don't have anything concrete for it to attach to, I simply find something to worry about. Therefore, I can worry about the smallest item -- starting with anything about my kids, my health, my many faults, my lack of completing something, etc. etc. When I felt down, Donel would say, "You always feel down in the winter." or when I let something go, he would remind me of my accomplishments. He was the family historian and could always lift my spirits. My kids can do this also, but I try not to burden them with my concerns. Dani is great with physical ailments because our bodies react similarly to the environment. She will say, "Mom, you have an ache because you drank a Diet Cola yesterday. You know that Diet Colas give you aches." She is the person who let me know why I felt weird when I began taking hormones since she could never take birth control pills because they made her feel the same sort of weird. Somehow, our genes gave us the same makeup. Jeni and Martin always give me good perspective on the world and their honest opinions. I treasure that. So, my dog and I are hanging out this morning doing little or nothing. He is barking at the mailman - something he does every morning about now. I am contemplating finishing the dishes and taking stuff back to the library. My house is a little chilly, but I'm too lazy to turn up the heat. Last night Dani and family and I were invited to the Tetricks so that Charles could give them information on Vietnam. The Tetricks and the Ennens are traveling there in March and Charles won't be home again until then. We had a lovely dinner - Patti brought appetizers from a Thai restaurant, Dani made a green salad, Millie had Salmon Wellington, and I brought apple pies. 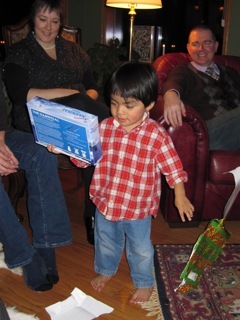 Nico played with all the grandparent toys and had a great time. I sent the rest of the apple pie home with James - now I wish I had kept one little piece to enjoy. It's grey outside and subdued inside. Perhaps I'll go put on a coat and stick my nose outside. Wish me luck and send me some energy! There are so many past Christmas memories when you are my age. Each of those memories include friends and family, food and decorations, trips, parties, special events -- too numerous to even remember. But, as Christmas rolls around again, anticipation is revisited and once again the day after Christmas is relaxed and filled with a grateful heart. I began Christmas day having breakfast with Dani, Charles, James and Nico at their home. James accompanied my drive down to Redmond in the afternoon, lost completely in his new iphone. His parents drove separately with Nico and the pup. Martin and Christine arrived soon after with wonderful appetizers, and we all enjoyed a fantastic dinner. Ron's Beef Wellington was the star of the show with Charles' apple pies coming in a close second. The pies almost matched the good taste of the beef, but could not come close to the presentation. I'm happy to say that the garbage truck was a big hit! And, I was the happy recipient of a massage, books, a wonderful soda stream (seltzer water maker), a few delectable books, and a promise of a trip to Vancouver for dim sum. The real presents for me are watching my family enjoy one another and have endless topics to explore. They are all such interesting and curious people -- traits that are so precious to me. It is fun to see them come together and share what they have been discovering or doing with their lives. And, of course, family memories wend their way through the conversation. Charles, Jeni, and I even got in a bit of piano playing and singing old, familiar songs in the parlor while Christine was reading her new book and the food was cooking. Dani and family and I stayed the night at Jeni's and Ron's and now I'm sitting at the big round table after a breakfast of apple pie and tea and staring over the soccer fields that are basking in SUN! Life is good. I may not eat for several days, but probably that is overstating it a bit. I am certainly full of contentment. Enjoy the sight - it is about to be devoured! Wow, Mom! More Presents at Aunt Jeni's! I"m calling this my downsizing season. I've cut back on home decorations and presents. I gave my children an experience for their gifts and today I am not plagued by last minute rushing and hyperventilating! I will report on one gift that I did splurge on -- I replaced my three-year-old grandson's garbage truck that I shattered with my car driving out of his driveway about two months ago. His mother insisted that I not worry since it had been James's and was old. But, he didn't see it that way. Every so often he looks at me with those huge brown eyes and says, "You ran over my truck." So, he will have a shiny new garbage truck on Christmas morning. Actually, it is a recycling truck with cool little bins to empty. I have enjoyed Christmas celebrations in local restaurants with friends and in their homes. I've gone down to Bellevue Square to see Allie in Snowflake Lane. My neighbor AmySue and I held our annual neighbors party at my house. Neighbors bring appetizers and wine, AmySue makes Martinis, and we chat from 5-7 standing around my dining room table with the goodies. In fact, nobody ever sits down. This year, we had the children at AmySue's with a babysitter so it was much calmer than last year when several new families brought along their little ones. Charles spent two days making Christmas cookies in my kitchen and yesterday I drove to Redmond and took Jeni, Allie, and Nicole to University Village to shop and then to the Queen Mary Tea Room. It was a lovely afternoon. After dropping them back in Redmond, I walked through Molbaks and made it home around 7:30. For the first time in over a week, I sat and watched television while I nibbled on dinner. Tonight the elder Craswells will join me and Dani's family for a traditional soup supper between the church services and I am going to sing in choir for the eleven o'clock service. Tomorrow, the McClellan/Wheelers and I will meet Martin and Christine at Jeni's for Christmas dinner. I hope whomever is reading this will have a lovely Christmas. Maybe I'll get busy and send out some New Year cards. It has been a dreary few days with some leftover snow, some icy streets, and darkened skies. Last night I went to the market to fill my dwindling refrigerator and drove home through rain and streets that seemed pretty clear. So, on a whim, I decided to drive around the block and through my alley in order to look at the candles in my windows. I wondered if they even showed from the alley. Much to my surprise (which reflects upon my naivete) I found myself slipping and sliding around the alley. It was as icy as could be. I simply had not anticipated it. After almost wiping out a neighbor and her dog, I did gain control of my car and turned around to avoid going up the hill at the end of the alley. That wasn't great either since the whole alley is a slight rise and I worried the whole way back to my street - keeping a grip on the wheel, keeping the wheels straight, and going fast enough to gain some speed to carry me along. I hate situations like that and I was mad at myself for not anticipating the conditions. My neighbor, Marley, said that the alley was always icy for days after a snow. I guess I had never driven it before in those conditions. In any case, my candles did look very nice shining through the dark night even if I couldn't take the time to bask in the glow. While I was at the store, Dani put the lights on my Christmas tree and dug my large porch wreathe out from under the shelves in the basement. I hate putting lights on the tree although I love putting on the ornaments. She is her father's daughter - much better at paying attention to detail than I am - so she offered to do the lights. I was grateful to come home from my alley adventure to a twinkling porch and a sparkling tree. I have to catch my breath every time I go to the market these days -- what used to cost $75 now seems to be somewhere around $140. I can't believe the price of groceries. But, my frig is clean and well stocked for a few days - so let it snow or rain or whatever -- I am snuggled in to finish my decorating. I'm going for a leaner year since I'm not planning any major influx of family or friends. I'm still dealing with my knee, but I have found that I now can walk around shops and in and out of malls much easier and with little or no discomfort. A few weeks ago, it began aching again (maybe the cold weather) so I went back on Aleve twice a day. Perhaps that has helped. I have also been busy observing interns who are finishing up their quarter, so I cancelled my physical therapy until January. We'll see. It still isn't completely well, but it is so much better that I am relieved not to be hobbling around. Dani and I have done some Christmas canning, but I haven't written anything let alone a Christmas letter. I may not get to it this year. We are all going to Jeni's on Christmas afternoon so maybe a few folks who are around will come here before church for Christmas Eve. As of today, it is quiet and peaceful and time to decorate the tree. No more alley drives for me this season. I'm going to go put on the kettle, the Christmas music, and unpack the ornaments. Poor little Nico is under the weather. The neighbor's children are sick and he possibly has what they have. Their doctor thinks the Swine Flu, but so far Nico has complained of leg aches, a bit of a stomach ache, and a small fever. He seems fine and normal when dosed with Tylenol so Dani has thrown him into his car seat and taken off to get Charles from the Seattle airport. He flew in early this morning and will be home for a month. Yea! But, it also means that I'm waiting for noon to call the Seattle Rep because the adults in the family were all going to a play tonight as my Christmas gift to them. I wanted them to see Equivocation, a new work that I saw this summer in Ashland. The Ashland cast has come to Seattle. But, I will change out Dani & Charles' tickets for another time and the rest of us will go. Maybe it will end up better in the long run because I think Dani was paying as much for a babysitter to take the boys as I did for the tickets. This way, they will miss dinner and the event with their siblings, but I can now watch Nico when they go to the play. The sun is trying to shine today. Yesterday was really beautiful and sunny although cold outside. I went to lunch with my birthday group. December 1st was Barbara's birthday and so we once again begin on our rounds of monthly lunches from December through April. This is our 28th year. When I said that to my group, someone said, "And, we're all here." That kind of talk always takes me back for a moment. I want to say, "Of course, we are all here." And, yet, after Judy's death, I'm very aware that us all being here is really a gift as we get to that age where some are not. Thinking about friends, an experience I had the other day has been on my mind. I had a car full of items from my circle to deliver to a charity for women. Afterwards, I decided to go to Costco and TJMaxx where I ran into my friend, Margie. She said she was looking for her husband who, for some reason, was not available by phone which was unusual. We chatted and parted. I said, "I presume you will find your husband. Call me if you don't and I'll help you look." I could see she was perplexed and a bit concerned but not overly so. After I got home, I began to feel really bad that I didn't stay with her or do something more. So, I called her and left a message asking what had happened. I apologized for not sticking around. Later, she called and said he had been bike riding and all was back to normal. She thanked me for worrying. I have been wondering about how many times I feel I've dropped the ball. I make a decision, but later think another decision would have been better. It was not as if I needed to get home or do something else. I wish I had suggested having a glass of wine somewhere and keeping her company while she waited to hear from Steve. I could see she was mildly worried. But, I didn't want to intrude or be too invasive. If she didn't want my help, she could have turned me down. Perhaps this is way too much contemplation for the situation, but I like to question my decisions now and then and try to steady the compass of my life. Next time, I'm going to offer something different to a friend in need.